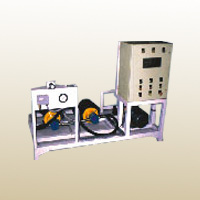 The centralized fluid transfer unit is essential for various applications of liquid transfer in different industries. No restriction on quantity or length of pipes. Our application engineers can support you in these areas. We are engaged in manufacturing and supplying Testing & Fluid Filling Equipment such as Leak Testing Equipment, Pump Testing, Transmission Testing Equipment, Training Equipments, Test Benches, Electro Hydraulic Equipments, Fluid Equipment, Centralized Fluid Transfer Equipment, Brake Fluid Filling Equipment, Fluid Dispensers, Oil Filling Unit, Oil Filtration Unit, Oil Dispenser, Valve Testing, Valve Test Rig, Valve Test System, Valve Actuator Test Rig, Gear box Test Rig, Gear box Testing, Gear box Test System, Leak Test System, Leakage Testing, Brake bleeding machine, Steering fluid filling machine, Radiator coolant filling machine, AC Gas charging machine, Clutch oil filling system. Developed more than 800 custom built equipments mainly for assembly line automation & testing. Precision applications where reliability & repeatability with safety is of prime importance. We transform Customers Ideas & Concepts in Mechatronics into Reality. We are into precision applications where reliability & repeatability with safety is of prime importance. It is the company with young, highly qualified technocrats with experience in India and abroad satisfying the automation needs of the industry for more than two decades.